to Chile. Bernard Landry has long touted a common currency for North America, based on the current European model. Kissinger was National Security Advisor and Secretary of State in the Nixon and Ford administrations. “In recent years a new international system has been developing, oriented toward the establishment of norms and principles of universal jurisdiction, above national sovereignty…. The construction of new rules of international co-existence must continue…we are actively participating in various forums in the construction of this international architecture…. Brzezinski was National Security Advisor for President Jimmy Carter. Time editor Talbott, Bill Clinton’s roommate at Oxford in the globalist Rhodes Scholarship program, became Clinton’s Deputy Secretary of State under Madeline Albright. Declassified 3-8-96 – “Hemispheric institutions…and now the NAFTA institutions, can be forged into the vital mechanisms of hemispheric governance….increasingly integrated by economic exchange and shared political values.” Anthony Lake was National Security Advisor to President Bill Clinton. New York Times 4-18-04 …. [T]he tribunal declared a Mississippi court’s judgment at odds with international law, leaving the United States government potentially liable for hundreds of millions of dollars…. “This is the biggest threat to United States judicial independence that no one has heard of and even fewer people understand,” said John D. Echeverria, a law professor at Georgetown University…. The availability of this additional layer of review, above even the United States supreme Court, is a significant development, legal scholars said….The tribunals have the potential to upset the settled American constitutional order. Lincoln P. Bloomfield, March 10, 1962. Corporate Author: INSTITUTE FOR DEFENSE ANALYSES, ALEXANDRIA, VA. Prepared for IDA in support of a study submitted to the Department of State under contract No. SCC 28270, February 24, 1961. “A ‘normal’ historical process, in which ever-larger units evolve through customs unions, confederation, regionalism, etc., until ultimately the larger units coalesce under a global umbrella, could take up to two hundred years, on past performance figures, and even this may be optimistic…. “I have suggested that an alternative road may bypass the main path of history, shortcircuiting the organic stages of consensus, value formation, and the experiences of common enterprise generally believed to underlie political community. This relies on a grave crisis or war to bring about a sudden transformation in national attitudes sufficient for the purpose. Robert Pastor, a leading intellectual force in the move to create an EU-style North American Community, told WND he believes a new 9/11 crisis could be the catalyst to merge the U.S., Mexico and Canada. 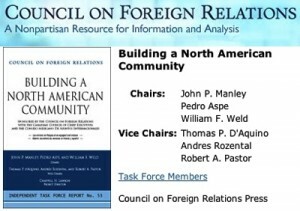 In May 2005, Pastor was co-chairman the Council on Foreign Relations task force that produced a report entitled “Toward a North American Community” which he has claimed is the blueprint behind the SPP declared by President Bush, Mexico’s then-President Vicente Fox, and Canada’s then-Prime Minister Paul Martin. ….The three announced an initiative dubbed the “Security and Prosperity Partnership of North America,” [SPP] which is designed to establish a common continental security perimeter against outside threats while facilitating the legal flow of people and trade across shared borders and increasing cooperation on energy, the environment and bioterrorism. Among other things, the three governments agreed to develop standardized rules for screening people and cargo arriving in North America, regardless of which country is the first point of entry…. But against the backdrop of security concerns, the three leaders [George Bush, Vicente Fox, Paul Martin] said they want to build on NAFTA and enhance economic integration to better compete against surging competitors such as the European Union, China and India. “North America should be the most competitive region in the world,” Fox said. [Mexican President] Vicente Fox voiced support for a European Union of North America, an institutional arrangement that would eventually result in the creation of a common market, the free movement of labor, and a common currency. Professor Robert Pastor of American University supports the creation of a North American Commission, a North American Parliamentary Group, and a permanent North American Court on Trade and Investment to replace the current NAFTA panels. ….In a recent survey, about a third of Canadian business leaders supported an EU-style integration in North America…. A 2002 report released by the Canadian House of Commons’ Standing Committee on Foreign Affairs …strongly endorses closer economic and security ties, including the formation of a security perimeter and perhaps even the establishment of a North American court dealing with trade and investment issues. ….To that end, the Task Force proposes the creation by 2010 of a North American community to enhance security, prosperity, and opportunity. We propose a community based on the principle affirmed in the March 2005 Joint Statement of the three leaders that ‘‘our security and prosperity are mutually dependent and complementary.’’ Its boundaries will be defined by a common external tariff and an outer security perimeter within which the movement of people, products, and capital will be legal, orderly, and safe. ….Lay the groundwork for the freer flow of people within North America ….A long-term goal for a North American border action plan should be joint screening of travelers from third countries at their first point of entry into North America and the elimination of most controls over the temporary movement of these travelers within North America. Task Force co-chairmen: former Massachusetts Governor William Weld, former Finance Minister Pedro Aspe of Mexico, and former Deputy Prime Minister John Manley of Canada. WASHINGTON (AFP) – Senator John McCain said Thursday the United States should “move urgently” to establish free trade agreements with Egypt and Tunisia but cautioned against increased spending in the region. …But McCain said the first regional objective should be the “peaceful change of regimes that are irreconcilably tyrannical, anti-American and hostile to the democratic regional order that we seek to build,” referring chiefly to Iran. 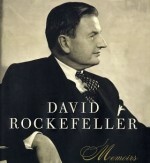 Rockefeller was chairman of the Council on Foreign Relations,1970-1985. He is now honorary chairman.